In this post I wanted to share the speech which I delivered at the Toastmasters International speech contest of this Spring 2018 at my club (Airbus Speakers, in Toulouse) and at the area level (comprised by 4 clubs in the region of Toulouse). The last time I competed in such contests was in 2012 (see here a post about that speech) and for this year of 2018 I put myself as a personal objective to take part in a contest again, in order to work deeper in a speech: drafting it, editing it, reviewing it with friends, rehearsing it… it is a good exercise. Most Toastmasters’ members do not like much to compete, but I believe it is a good learning experience as I explained in this other post. The message of the speech: share your passion with your children and take time to enjoy it together with them, a kind of carpe diem. With that in mind, I included in the speech most of the ingredients that make a speech as complete and varied as possible, i.e, body language, use of space, eye contact, voice variation, use of props, personal experience, quotations, etc. That is why I wanted to prepare exhaustively a speech as an exercise. See below the criteria used by the judges to evaluate a speech in order identify the ingredients. Toastmasters’ International Speech Contest judge’s ballot. I wanted to thank Nacho, Jaime and Luca for helping me with the preparation of the speech. Today, our club president announced that #Airbus Speakers Toulouse is now a @Toastmasters chartered club (#3907012). Hats off to @edhered. In order to read out the speech, the manual gave tips on how to write the speech in paper: large fonts, short sentences, bottom of each page blank, etc., very useful tips. See below how for a 10-minute speech, about 1,000 words (4), it took 7 pages, instead of about 2 that it would have normally taken (find here the speech) [PDF, 623 KB]. In our club, we not only have a word of the day but we have a theme of the day, picked by the Toastmaster of the day (5). Yesterday’s theme was Hollywood. You can see how, as soon as I learned about the theme, I decided to make reference of a movie which featured Chuck Yeager (6) as I was quoting a couple of sentences from him. Funny enough, I had learned about that movie thanks to my brother Jaime just a couple of days before. The speech talks about safety in general aviation, putting the emphasis on precautionary landings when the situation deteriorates. The idea of the speech comes from a safety note published by my flying instructor, Thierry, some time ago in the internal bulletin of the aeroclub. He referred then, and I do so in my speech, to a couple of studies from the French Bureau d’Enquêtes et d’Analyses (BEA), principally one called “Objective: Destination” [PDF, 318 KB]. Finally, see below the video of the speech. The recording starts about 30″ after the speech started and the quality is not very good. A good part of the image is taken by the table in which the camera rests and the light is not optimal. The sound is not great either, as neither is my vocalisation. In fact, that was one of the criticisms that I got, as part of a generally good feedback (7): I should vocalise more clearly. Nevertheless, I must say that I enjoyed delivering it. (1) That is in Toastmasters language that we are an official club within the organization. (2) From the version of 2009, as I have later learned that manual contents and organization have changed since then. (3) By the way, for this speech: I had it written 4 days ahead of the meeting. I rehearsed it 8 times. Seven of them having Luca as an attentive mentor. (4) At my speaking pace. (5) The master of ceremonies in Toastmasters language. (6) A NASA flight test pilot. (7) Feel free to comment and provide feedback below :-). I was reminded by the following tweet from a fellow Toastmaster from Finland of a funny anecdote from a few years ago. In May 2011 Luca and I attended the annual shareholders’ meeting of Berkshire Hathaway (see here a post describing the experience). One of the activities for shareholders that we joined was to dine on Sunday evening at Piccolo’s, a steakhouse popularized by the taste of Warren Buffett, apparently a frequent customer (we indeed happen to have him dining together with Bill Gates two tables away). The anecdote I wanted to share in this post stems from my rather strong Spanish accent when speaking English, together with the little vocalization effort that I put sometimes in my speech plus the use of the phonetic alphabet to spell words. When I wanted to book a table at Piccolo’s to have that dinner, I was asked my surname, which is uncommon even in Spain, thus I spelled it: India, Romeo, Alfa, Sierra… Hours later, we arrived at the restaurant and informed the waiter that we had a reservation, at the name “Irastorza”. She went to check her registry. Swiftly and politely she said: “sure, come along with me”. I was close enough to her to see that in the book she had just noted: “India”. Thanks to the drive of some individuals (Sarah, Eduardo, Dominique) a new Toastmasters corporate club (1) is being created within Airbus in Toulouse, where I work. I joined Toastmasters in 2007 when I lived in Madrid and I have written often about Toastmasters in this blog, however I had become inactive in the last couple of years. This new initiative is very convenient and thanks to it I am engaging myself again in the association. The topic of the speech is known for the reader of this blog: impact of delays in aircraft development projects seen as investment projects, the time value of money, discounting cash flows, break even, etc. The feedback that I got: It was well received, especially the introduction, the interaction with the audience, the structure and how the topic was introduced and the main points called back in the end. However, I lost some individuals with the last slide, which needed some more explanation. I should have simplified the graphic. Some demanded more pauses and better vocalization. (1) Up to now it is a prospect Toastmasters club. (2) Project #1 of the “Speeches by Management” advanced manual: “The briefing”. I subscribed to the Humorous Speech competition of my Toastmasters club in Toulouse, Rosemasters, before the summer break. The contest was held last Saturday. I had competed in the previous round of contests of the club back in March, when I was lucky enough to win the speech contest. You may see the speech in this post. For the speech contest of last Saturday I procrastinated a bit more. I thought about the topic during the week of the contest: self-deprecation about my integration in France, OK. But only got to write the speech the morning of the contest. I enjoyed the delivery of the speech, but I guess it was not as good as it should have been. What is worse, even if nobody but Luca and me noticed, I forgot a whole minute of speech with a couple of good lines… this is what happens when you don’t prepare. I came in last of the 3 contestants in terms of judges’ evaluation. Deservedly. Hopefully I will learn the lesson for the next time. The winner, Dominique, on the other hand made a wonderful speech using an ukulele, which he had purchased for the speech about a month ago, learnt to play few notes to accompany the speech, thought of tens of uses for the ukulele within a speech, put up a great structure, used lots of body language, storytelling… I loved his speech. Congratulations to Dominique! Pierre de Coubertin said “The most important thing is not to win but to take part!”. After two years serving as Area Governor in Toastmasters, last weekend speech contest at Toulouse Rosemasters was the first time in which I could take part in speech contests again. I didn’t leave this opportunity. Some people do not see what is in the competition for them. They tend to see it as very much American. Or they may think there is someone who is a better speaker, thus, no purpose in battling in the competition. Others may be afraid not only of public speaking but even more if there is a competition around. I may understand those points, nevertheless I still think Toastmasters’ members should give it a try. There is always something to learn from that experience. My speech in the contest was a try to explain that. About 2 weeks ago I gave a speech at Rosemasters club about the performance of clubs and its relation with the amount of members they have. My assignment was to give a 5-7 minute fact-finding report and then handle a 2-3 minute Q&A period. You may find the video and the script of the speech below. In this post I just wanted to share a couple of graphics I produced while preparing the speech (one of the graphics is used in the speech) which I find quite revealing for Toastmasters club and district officers. I took the figures of Toastmasters District 59 clubs at the end of the period 2009-2010 (173 clubs) and checked goals achieved within the DCP program per club versus the members they had at the end of the period. Excluding the clubs chartered within that same year (for which it’s complex to achieve many of those goals in less than a year), I found a clear trend that the more members the club has, the more goals it achieves. 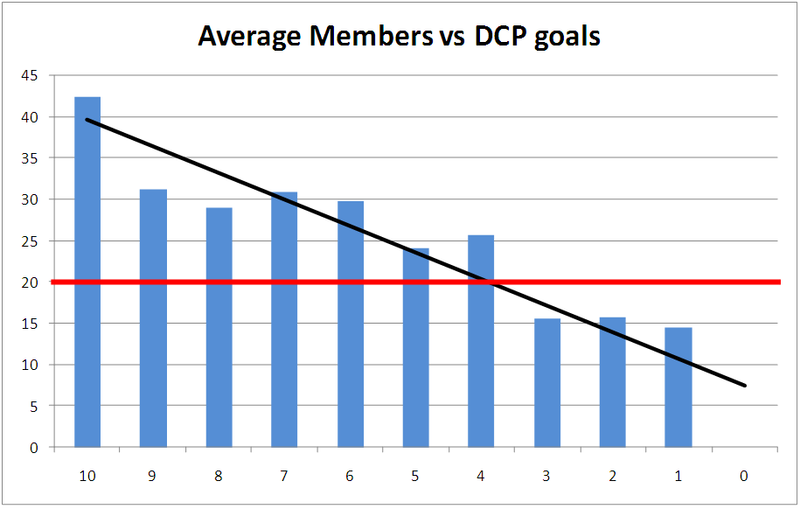 Average members in a club vs. DCP goals achieved (D59 2010). This fact is so simple that no fact-finding was needed, but I wanted to check whether there was a real difference in membership between average clubs (those meeting 4, 5, 6 goals), good clubs (achieving 7, 8, 9) and the top ones (reaching 10). And the answer is yes. Top clubs have in average over 40 members. Good ones have around 30, while average ones have around 25. Thus, I believe that clubs should not be content with reaching 20 (as DCP requires) or 25 members. Their goal should to reach around 40 members and ensure they have the highest quality. In that way they would also be on the safe side and resist any sudden loss in membership. Clubs having that many members may face issues of finding slots for members to take active roles in meetings, I guess that the preferable solution is to have extra meetings (meet weekly). The other interesting graphic shows to what extent incentives shape reality. As Toastmasters officers know, clubs are distinguished when they reach 5, 7 or 9 goals out of 10. A club that achieves 6 goals gets the same recognition than a club reaching 5 (the same applies to a club reaching 8→7, or 10→9). So you can see how officers push members in order to achieve either 5, 7 or 9 goals and how most of the clubs reach exactly those numbers and just a few end up the year with an even number of goals. 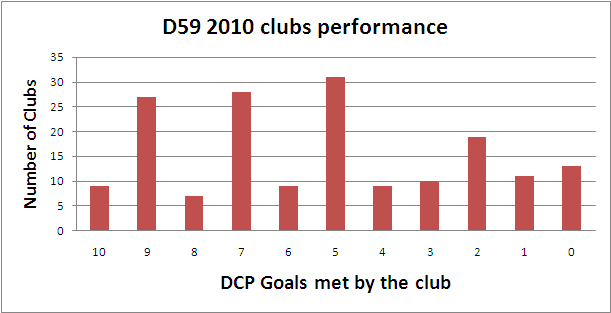 Number of clubs with a given DCP performance (D59 2010). What do you think this represents? I joined TM in 2007. At that time, there were 3 clubs in Madrid: Standing Ovation, Excelencia and TM Madrid, which is the club I joined. Why did I join? Because I saw a great atmosphere, listened to 3 different prepared speeches, good evaluations… I thought “this is a club I want to be part of”. We can say that the Quality of the club was high. In this speech I will try to show you that in Toastmasters Quantity leads to Quality. I will go through personal experience, a bit of history and some statistics. 6 months after joining the club I became an officer, I was the VP education. Then I started taking note of the number of members and guests that came to every meeting, I did this for 2 years… I can tell you that as this number grew, the meetings were getting better, etc. Let me now tell you something about Toastmasters. In Toastmasters there is a system for evaluating clubs. This system is called the Distinguished Club Program, the DCP. It measures several things: how many members achieve CC, AC, how many new members come into the club, etc… The DCP tries to measure the Quality of the club. There are 10 goals in the DCP that clubs should try to achieve. If a club reaches 5 or 6, it is recognised as Distinguished Club. If a club reaches 7 or 8 goals it gets a higher recognition. If a club reaches 9 or 10 goals is awarded the maximum recognition: President Distinguished Club. Now let’s see how Rosemasters was doing these years. Rosemasters was founded in October 2008. That 1st year ended with 22 members and achieved 3 DCP goals. The 2nd year it was already recognised as Distinguish Club, for having achieved 5 goals, and finished with 22 members. This year, in its 3rd year of existence, it has already achieved 7 goals and can achieve 9, with 20 members. For this it will be recognised as Select Distinguished Club or President. I gathered statistics from all 173 clubs existing at last year end in Europe. Best performing clubs, with 10 goals, had above 40 members. Clubs with a result like Rosemasters this year (7, 8, 9) had on average have 30 members. Clubs which achieved 4, 5 & 6 goals had ~25 members. The weak clubs had ~15 members. Let’s now look at clubs of the size of Rosemasters: between 18-22 members. They do not achieve as many goals as this club as achieved; this is why what this club has achieved is remarkable. Why do I tell you this about Quality and Quantity of members? As I said at the beginning: I believe that in Toastmasters Quantity leads to Quality. I believe that to make sure that this club continues to be healthy, that we continue to enjoy good meetings, we need more members. We should try to have at least 30 members, and then retain them. How to do that? We can discuss I in another speech. But remember in Toastmasters Quantity leads to Quality.